We went to Keriwa Café to experience what I can only describe as aboriginal haute cuisine. 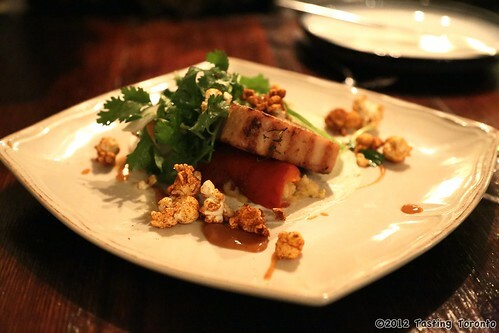 We were pleasantly surprised with how delicious an experience it was, on par with some of the best restaurants in town. The first thing you notice when you enter Keriwa Café is that it's one relatively small room with a full view of the bustling kitchen directly across from you, with a small bar on the far left. It's definitely not white linen, and if you just accidentally stumbled upon it you wouldn't know that it was a fine dining establishment. That subtlety, along with some discreet aboriginal decor and birch bark on a part of the wall, made it feel very inviting and very accessible. The wait staff was somewhat informal, but very friendly and quite knowledgeable about the dishes and the ingredients that went into them. 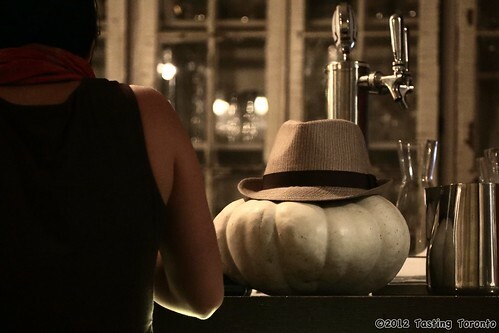 I don't know if it was the fedora'd pumpkin on the bar or the word maple that enticed me to order a Maple Old Fashioned ( bourbon, maple, black walnut bitters ). Despite it falling into our "old man drink" classification ( i.e. Stacey won't drink it ), I thought that in keeping with our local theme for the night, I should give it a shot. It was good for what it was, but as with a Manhattan and other whisky based cocktails, its particular notes of musty cigar smoke filled bookshelf lined piano bar, causes one to see everything in sepia and want to shuck oysters and smoke Montecristos, while a tuxedoed waiter whips up a table-side Caesar salad... but I digress. While waiting for our appetizer we nibbled on some good bread with creamy organic butter and a drizzle of salt... and some strangely bright orange coloured and very yummy spread that turned out to be seasoned, whipped Berkshire pork fat. 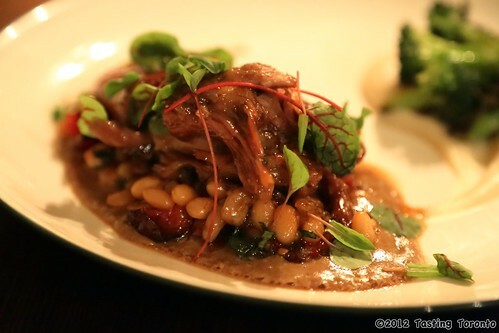 We started with a succulent and generously portioned Confit Pork Belly app. That was a ridiculously good appetizer if your definition of appetizer is something that makes your mouth water. The tender meat fell apart in my mouth whilst oozing all that salty fatty goodness. A little Asian fusion going on here with the cilantro balanced the richness of the pork nicely. The roasted red pepper and spiced popcorn added other layers of texture. For mains, we had the Bison Skirt Steak and the Lamb Shoulder. 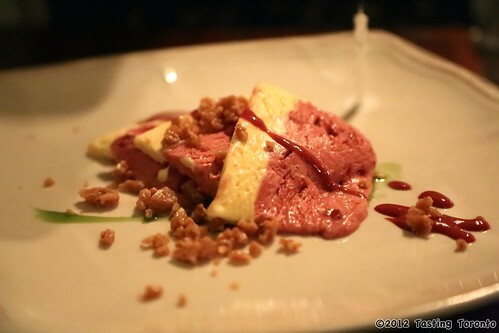 The bison looked incredible festive with tender, mildly gamey meat topped with bullberries, and nuts. 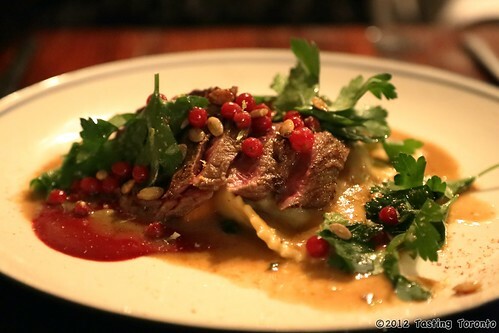 The tart bitterness of the bulberries and and the crunchy nuts complimented the meat well and provided a good textural contrast to the decadent and juicy bison ravioli underneath. The actual fresh pasta wasn't so thrilling, but the filling and everything else more than made up for it. My first thought upon seeing the lamb shoulder was "that's kind'a small," but as it turns out big taste can come from small packages. Often I mill around the periphery of dishes and taste its layers in isolation before going for that synergistic bite of everything together. I started with the smeared cauliflower purée and was pleasantly bewildered at how something can taste so light and rich at the same time, airy and creamy, a neutral yet powerful canvass. But even more delightful was the sauce on one side of the lamb, which seemed like a less viscous but jacked-up, fat-infused refrito. The lamb was so tender that it easily fell apart with the slightest prodding and was so densely packed with flavour and wholesomeness that it's apparent small size seemed like an optical illusion. 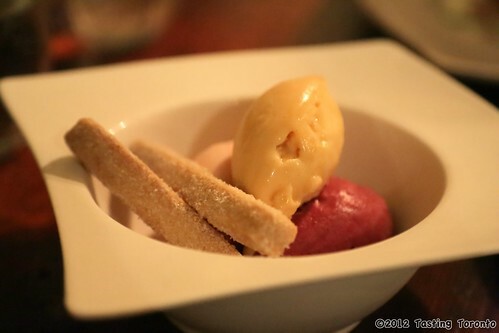 Often we find that the dessert menus at restaurants are thematically disconnected from the rest of the food, much like an afterthought rather than an integrated part of the dining expereience. Keriwa's desserts are a very welcome exception, keeping up with the local motif, infused with flavours and textures that on a whole can be considered very Canadian. I usually grab a cappuccino with desert, but since part of our dessert include a cheeseboard, I chose to go with some port this time around. I'm glad I did. The very delicious Saskatoon & Sea Buckthorn Semifreddo with nut brittle was absolutely transformed and infinitely better with port. Dessert number 2 was a trio of refreshing sorbet quenelles: Peach Buttermilk, Wild Grape, and Crab Apple, in that order with our favourite first. To cap things off, we had a cheeseboard where we could choose to have 2 of 4 available cheeses. Our first cheese was "14 Arpents," a nutty tasting, soft paste cow milk cheese from Quebec. Our second choice also from Quebec, was "Grey Owl," a goat's milk cheese with an ash covered rind. It was characterized by a white, firm, dense paste that crumbles in your mouth, with a sharp taste. 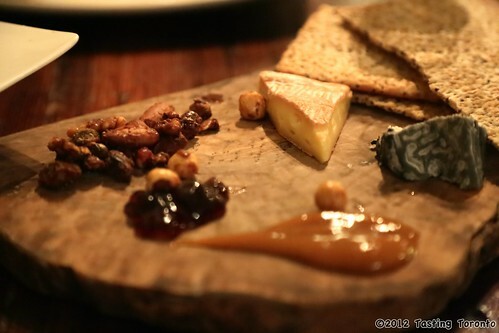 The cheeses where heavenly together with the spiced nuts, Saskatoon jelly and apple jam, washed down with some port. Cheese, particularly the more pungent and flavourful ones, just doesn't taste the same without an accompanying wine to release all those locked-in nuanced notes. Keriwa Café totally blew us away with the calibre of its cuisine. My only beef with the place was that it was incredibly smokey and you'd totally perish if you happened to be wearing contact lenses. The woodsmoke smell totally gets into everything, and you end up smelling like a campfire, which if you want to be authentic may appeal to some. Ah the small price to pay to for such good food. Sadly, the day we were there was one of the last ones for this restaurant's à la carte menu. Keriwa will be serving tasting menus on selected evenings of the month, and become a private dining and special events centre. You can contact the restaurant to be put on a list for these special tasting events. I've read a lot of your stories on restaurants and foods and menus, and I've always found them to be quite informative. For the past couple of weeks I've been out to a few restaurants in the Kingsway (Henry VIII Ale House), and Roncesvalles (The Dizzy - Gastro Pub), and I was wondering if you are familiar with this product: Red Soss. I'm not sure if it's new, but I've never seen it before. At Henry VIII, I ordered a Caesar, and the bartender added a shot of the sauce from the bottle instead of Tabasco; and, at The Dizzy, I watched many people using the product like catsup for fries and dipping their wings in it. I think that it must be from Toronto, I'm just asking, if you know anything about it? Thanks for reading our blog - we're so glad you enjoy it. We love love love hearing from readers - especially when they teach us something new! You know what, we've never come across Red Soss oddly enough, especially since it sounds like something like that would be featured at the Hot & Spicy Food Festival down at Harbourfront in Toronto that we've been to a couple times... somehow we've never stumbled across it! Did a quick bit of research, and it claims to have layers of flavour that start out with sweet, then moves to heat - says it can be used as a marinade or a dip. As you said, seems to be able to be a stand-in for traditional Tabasco in a Caesar like you had at Henry VIII. Fascinating!